Is a military record with false information messing up your life? Are you unsure of how to go about the long process of fixing it? You only have three years from when you discover the error to fix the record, so don’t waste another minute or time could run out. Attorney Kenneth Carp, Lt. Col., USAF (ret.) understands how to represent you. You can successfully change your military record. With more than 20 years of legal experience, our St. Louis-based firm strives to provide detailed guidance to clients in Missouri and Illinois. Our staff strives to offer detailed advice you need to understand your various options. Contact us to schedule a free consultation to discuss your specific concerns and learn how we can be of assistance. The attorneys at The Law Office of Kenneth P. Carp, PC know the rules regarding changing military records and gets them to work for you, with over twenty years of court experience our senior attorney Kenneth Carp, a retired Lt. Colonel with the US Air Force, has the right experience to represent you. Call (636) 947-3600 to schedule an appointment. 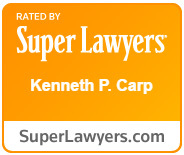 The lawyers at the Law Office of Kenneth P. Carp offer extensive experience to people in Missouri as well as in other states nationwide.